With metal bear silhouettes with openwork accents, the Metal Art Bear Bathroom Hardware completes your rustic home. Create rustic style in your bathroom with the Metal Art Bear Towel Bar & Shelf, enhanced with a bear and pine tree silhouette with a convenient bar for hanging towels. 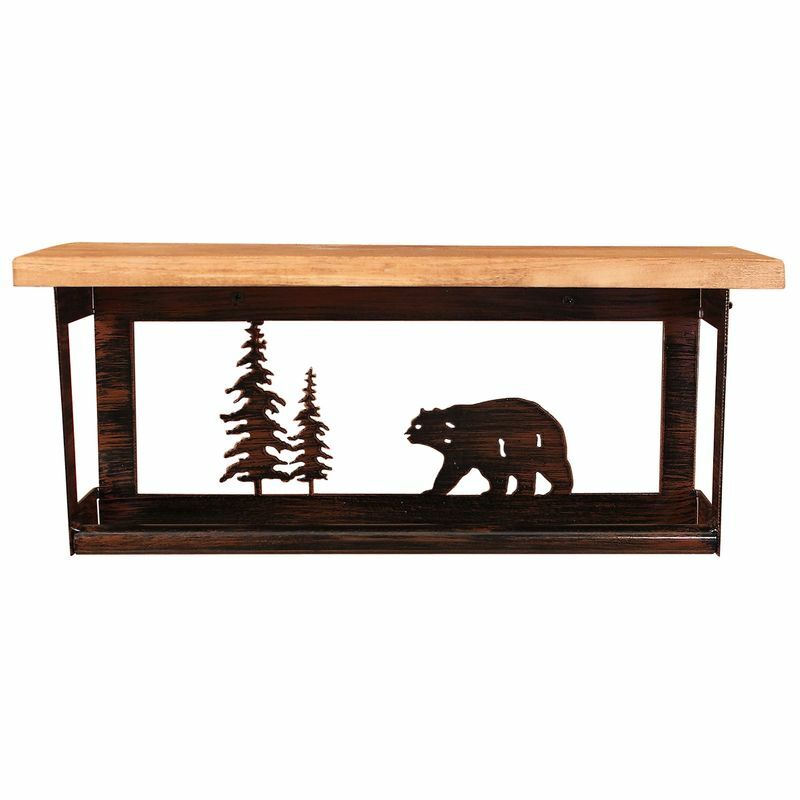 The Metal Art Bear Wall Shelf with Hooks enhances your rustic entry hall with a bear and pine tree silhouette with five hooks. Give your bathroom a rustic update with the Metal Art Bear Toilet Paper Stand/Magazine rack. Crafted with iron bear and tree cutouts, this toilet paper stand/magazine rack makes a beautiful accent. A Black Forest Decor Exclusive - A metal art bear tops the iron Metal Art Bear Toilet Paper Stand in a burnt sienna finish that is perfect for your rustic bath. Made in the USA. Measures 10"W x 10"D x 30"H. ~ Ships from the manufacturer. Allow 2 to 3 weeks. Cannot express ship. Create a cabin mood in your bathroom with the Iron Arm Bear Toilet Paper Holder, enhanced with a lumbering bear. Accent your cabin bathroom with the Iron Bear Toilet Paper Box. This toilet paper holder features lumbering bear for a beautiful addition to your home. With its lumbering bear, the Iron Bear Hand Towel Holder is the perfect addition to your cabin bathroom. Create a cabin mood in your bathroom with the Iron Bear Towel Bar, enhanced with lumbering bears.